Walkers on the gentle High Street range look towards the Helvellyn range. 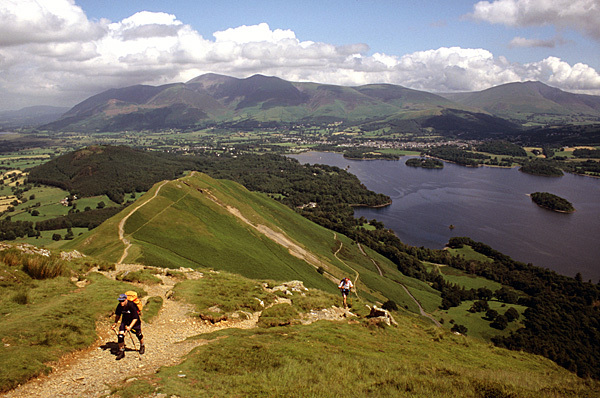 Walkers on the ridge between Maiden Moor and Catbells above Derwent Water. 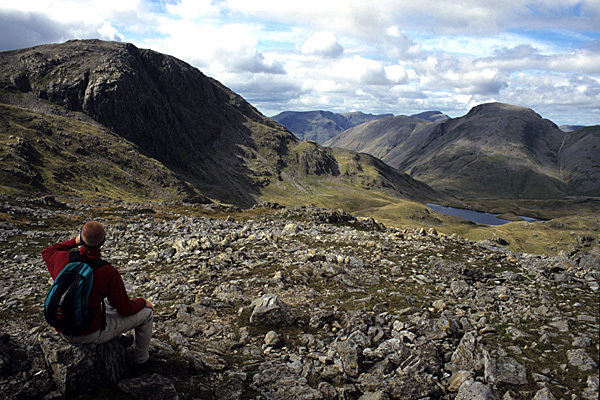 A walker near Esk Hause looks towards Great End and Great Gable. This book grew from a single lament on an email bulletin. Why do so many people insist on bringing their cars to the Lake District when there are so many buses rattling empty, and many car parks are filled to overflowing? Almost by return email Questa offered an opportunity to write a small, unillustrated guidebook highlighting a variety of walking routes that could be followed over the fells, from dale to dale, from lake to lake, from village to village, using public transport throughout. 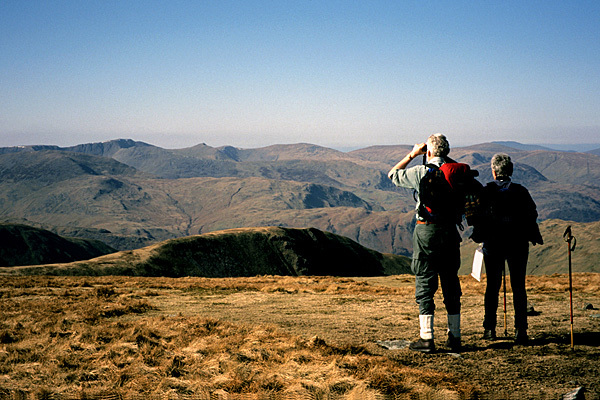 Not only is there a good basic bus service in the Lake District, but in the summer months it expands into more remote parts and opens up a wealth of walking opportunities. Freed from the tyranny of the motor-car, and the need to walk in circles to return to the dreaded tin box, walkers can instead keep moving and enjoy longer and better walks. Not only are there good bus services, but railways around Cumbria provide good access to the area, and there are ferry services around and across some of the larger lakes. A combination of trains, buses and ferries can be tied into a series of fine walks, and a selection of 20 routes are offered in the book. The idea is to think green and not bring a car to the Lake District. It is supposed to be a National Park, not a National Car Park! In a review in The Rambler magazine, the book was described as offering "20 routes for the fitter walker from a great walking writer. There are useful background notes and a convenient pocket format."